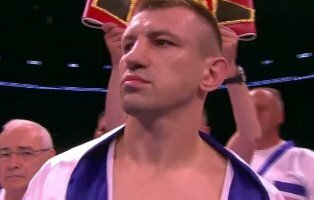 By Dwight Chittenden: Heavyweight contender Tomasz Adamek (47-2, 28 KO’s) survived a 2nd round scare tonight when he was knocked down by the power punching Travis Walker (39-8-1, 31 KO’s) at the Prudential Center in Newark, New Jersey. However, Adamek, 35, was able to get back up and survive the round, which also saw the 6’4 1/2″ Walker get knocked down. Adamek then boxed smart and was able to take control of the fight and get a 5th round stoppage when he had Walker out on his feet. The fight was then stopped at 1:08 of the round. It was a good win for Adamek, #4 IBF, #9 WBC, #12 WBA, as it keeps him within grasp of a title shot against IBO/IBF/WBA/WBO heavyweight champion Wladimir Klitschko. Adamek hopes to get a shot against Wladimir next year if everything goes alright with his next fight or two. In an important undercard fight, former IBF cruiserweight champion Steve Cunningham (25-4, 12 KO’s) bested journeyman Jason Gavern (21-11-4, 18 KO’s) by a 10 round unanimous decision. The judges scores were 100-90, 100-90 and 99-90. Cunningham looked good in his first fight at heavyweight, hitting Gavern at will with nice combinations and connecting with a lot of hard jabs to the head. It was a good fight. The only problem that I could see from Cunningham is that he looks too light to compete against the better heavyweights in the division. He was little more than 210 pounds for the fight and that’s just too light to beat any of the bigger heavyweights in the division given that Cunningham really isn’t a big puncher at this weight. Gavern was someone that he needed to knockout to prove that he belongs in this weight class and he couldn’t do it. In a total blowout, unbeaten heavyweight prospect Bryant Jennings (15-0, 6 KO’s) destroyed Chris Koval (25-10, 18 KO’s) by a 1st round knockout after knocking him down twice in the fight.